1968’s Beyond the Law is far from a perfect movie, but that doesn’t mean it’s not an entertaining movie, because it is in deed that. One of countless Spaghetti Westerns that surfaced in the 60’s and early 70’s, you might not even know this one existed – I didn’t, until recently, that is. You see, about a year ago I purchased a DVD set, titled. “Spaghetti Westerns” that is chock full of Western goodness (and badness to be honest). 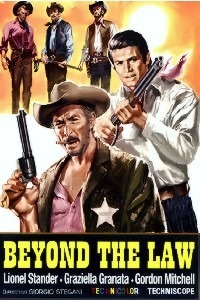 It’s a five disc set that includes 20 movies – Beyond the Law was one of them. Beyond the Law tells the story of a group of bandits that dupe a mining company of the cash it is having delivered to pay the wages of the miners. Through deception, the actual crooks look like heroes, and are actually asked to help out. The brains of the unit, Billy Joe Cudlip (played by Lee Van Cleef), befriends Ben Novack (played by Antonio Sabato), at first pitying him and then gaining respect for his abilities as the movie goes on. Soon Culdip and his gang is helping protect the mining operation from a gang, controlled by the villain, Burton (played by one time muscle man turned actor, Gordon Mitchell). Gaining respect, Culdip is asked to become the new Sheriff, kind of ironic…really. He takes the position, much to the chagrin of the members of his small band of thieves, especially when they realize that he might just be taking the job seriously. As noted at the beginning of this post, this is far from being a perfect film, but Lee Van Cleef raises it up and makes it entertaining. Also, the theme song is simply amazing. If you already like Spaghetti Westerns, then this one will be okay – If you are on the fence about the genre, then maybe leave this one be and try something like a Fist Full of Dollars or God’s Gun. This entry was posted on July 8, 2013 by catfishman. It was filed under 1960's, 60's, animals, Awesome, b movies, comedy, confusion, cover up, crazy, crime, death, different, drive in, dumb, entertaining, entertainment, evil, family, film, fun, good, great, Grindhouse, gritty, hate, heist, humanity, injustice, Italian, kidnapping, killers, Morricone, movies, murder, music, original, powerful, prison, revenge, sacrifice, self preservation, silly, Society, Spaghetti, stupid, theatre, torture, trailers, Van Cleef, watch, Western, Wine and was tagged with 1960s, 60's, animals, awesome, B Movies, comedy, confusion, cover up, crazy, crime, death, different, drive in, dumb, entertaining, entertainment, evil, family, film, fun, good, great, grindhouse, gritty, hate, heist, humanity, injustice, Italian, kidnapping, killers, Morricone, movies, murder, music, original, powerful, prison, revenge, sacrifice, self preservation, silly, Society, Spaghetti, stupid, theatre, torture, trailers, Van Cleef, watch, western, Wine.